The Social Shake-Up is May 6-8 at the beautiful Marriott Marquis in downtown ATL - Sign up today! The Social Shake-Up is May 6-8 at the beautiful Marriott Marquis in downtown ATL - Sign up today! Join us in Atlanta, America’s largest entrepreneurial hub and the peachy capital of Georgia! Experience urban energy and a stylish vibe at the newly renovated Atlanta Marriott Marquis. This newly modernized downtown Atlanta hotel puts you near sites like Georgia Aquarium, World of Coca-Cola, CNN Center, GWCC, Georgia Dome and College Football Hall of Fame. 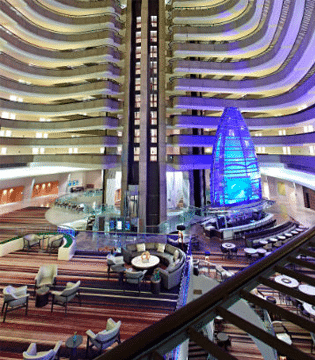 The hotel’s amazing atrium is marked by the 50-foot color changing sail of Pulse, a cool cocktail lounge and iconic symbol of this downtown Atlanta hotel. The Atlanta Marriott Marquis is now sold out. You can book a room at one of the nearby hotels below for the 2019 Social Shake-Up Show on May 6-8 in Atlanta. .2 mile / 4-minute walk! Discounted rate of $169/night available through April 24. Call 1-888-627-8968 and mention group name Social Shake-Up. .3 mile / 6-minute walk! Discounted rate is $169/night through April 19 or until we sell out. Book here or call 404-523-5155 and mention group name Social Shake-Up. Discounted rate of $169/night available through April 15th or until we sell out. Book here or call 1 404-222-2416 and mention group name Social Shake-Up. Discounted rate of $189/night available through April 19th or until we sell out. Book here or call 877-946-8357 and mention group name Social Shake-Up. Travel Discounts: We have exclusive travel discounts with United Airlines and Delta for up to 10% off! Delta Airlines: Visit www.delta.com, select Book a Trip, click on More Search Options and enter the meeting code, NMSMC in the box provided on the Search Flight page. The Group Ticket Designator, if prompted, is NGKDN. Attend the Social Shake-Up Show! Join other Shakers for networking activities! 2019 activities include an opening reception, a cooking class, Drinks with Shakers plus opportunities to visit the World of Coca-Cola, Georgia Aquarium, Center for Civil & Human Rights, CNN Tour, College Football Hall of Fame and Ponce City Market. The concierge at the Marriott Marquis Atlanta will be happy to assist you in arranging activities that will help you make the most of your stay! The Social Shake-Up is a three-day conference designed for the marketers, communicators, content creators and business leaders who are helping to shape the social strategy at their organizations. These social media trailblazers attend The Social Shake-Up to focus on the ever-changing digital landscape, and to grow their social business skills. Is there hotel room block for the Social Shake-Up? Yes, we have a room block for the dates of May 3 through May 11 at $195/night. This room block expires on April 22, 2019. Book now! A limited number of event sponsorship opportunities are available for this three-day event. Please contact Sales Director Katie Sullivan at ksullivan@accessintel.com to book your spot. To be considered, please email Caroline Waxler. You can register online on our secure site. If you have any questions or concerns, please call or email our Client Services team at 800-777-5006; clientservices@accessintel.com. Registration includes continental breakfast, access to all sessions, lunch, break beverages/snacks, a workbook and access to speaker presentations. If you’re interested in becoming one of our media partners and/or attending to cover the events, please submit your request to Client Services at clientservices@accessintel.com. There are very few spots available and due to the high volume of requests, only those chosen to attend will be notified. You may substitute another individual in your place at no extra charge, but we do not refund registrations. That is stated in the registration confirmation message. If transferring, please forward the information to Client Services at clientservices@accessintel.com. I have a question about the Social Shake-Up that I did not find here. What should I do? Email questions to Client Services at clientservices@accessintel.com.